The geographically wide and intense nature of the earthquake damage and the complexity of the highly time-sensitive search and rescue missions have necessitated the use of advanced technologies in the decision support mechanisms currently employed by AFAD (Afet ve Acil Durum Yönetimi Başkanlığı) and its connected branches. Hence, not only AFAD’s perspective on search and rescue mission profiles has to evolve, but also more focus on aftermath management, damage control systems, and the requirements to further improve the search and rescue missions needs to be established. To address those needs, it is necessary to first gather reliable information about the damage, the status of the buildings and the infrastructure, and the road and traffic conditions. It is also necessary to complete the information gathering phase as quickly as possible in order to be able to make decisions of vital importance and act accordingly. Unmanned Air Vehicles (UAV) nowadays have been utilized in many application areas with the defense industry being the foremost player. As a result of the advancements in UAV technologies and the reduced operational costs, more research on and increased usage of UAVs to ease daily life and increase life quality come to orders. The aim of Cankuş (meaning Life Saving Birds in Turkish) project is to develop smart earthquake damage detection and rescue systems that can move autonomously or remote control by the utilization of UAVs. Project Cankuş is a combination of UAV’s, their specialized sensors, equipments and computer algorithms that are specialized for the problems encountered commonly during earthquakes. 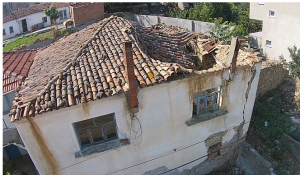 This project proposes the use of UAVs to assess earthquake damage, to provide information to the disaster search and rescue teams that will be formed right after an earthquake and to have the collected information immediately processed and fused with geographical information systems in order to support longer-term help and support missions. Additionally, the UAVs equipped withinfrared cameras will play active roles in rescue missions especially after earthquakes taking place at night time. Lifebirds will immediately route this information to disaster management centers. Finally, using thermal cameras Lifebirds will also be available for use in rescue and damage assessment missions inside buildings that might not be safe to be entered by humans.